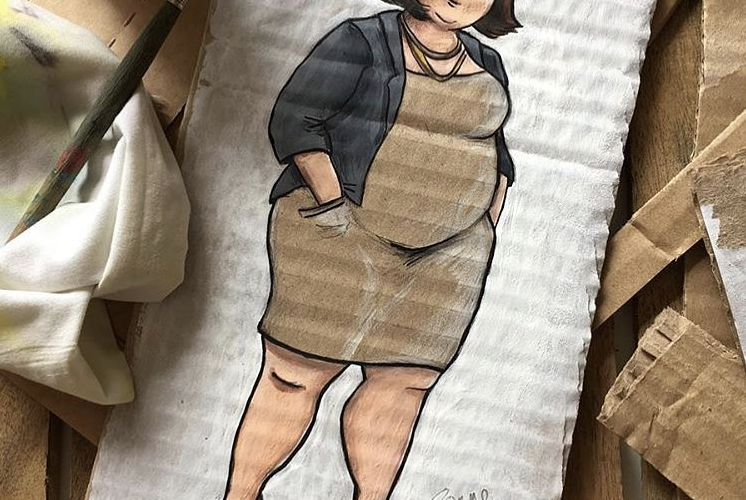 Cardboard. Amongst the most innocuous of materials, right? Wrong, as it turns out. Over the past few weeks, I’ve transformed cardboard into an unexpected weapon against gender inequality. Specifically, I’ve targeted the lack of diversity in many ‘male, stale and pale’ executive boards of FTSE 350 companies. Although it’s hardly a new issue, it’s one many believed was well on its way to repair following targets set by the Hampton-Alexander review, for boards to be at least 33% female by 2020. Sadly, scarcity of females in leadership positions at these powerful companies has come to light again following the publication of the Investors Association Gender Equality report, which called out fourteen companies for having all-male executive committees. Of these fourteen, one, in particular, caught my eye: Smurfit Kappa. A couple of weeks prior to reading the report, I’d been looking back on my university days and thinking about my final year dissertation. I’d written about a cardboard box manufacturer called the Container Corporation of America that commissioned Bauhaus artists fleeing the war in the 1940s to create artworks for the company – subsequently becoming a pioneer both in modernist design and diversity. The company’s owner, Walter Paepke, created this alternative but wildly successful corporate culture following his wife’s advice – involving her in every decision and demonstrating that diverse leadership enables true innovation and progress. Curious to find out where the Container Corporation of America had ended up, I learnt they’d merged to become part of a bizarrely named company: Smurfit Kappa. I immediately recognised this strange name again as it appeared in the FT as one of the fateful fourteen in the report. I was distraught to find that the Container Corporation’s legacy was lagging so dismally behind in gender diversity targets. What’s more, Smurfit Kappa had refused to comment, showing no engagement with the problem whatsoever. I felt determined to change this. The one encouraging takeaway from the report was that some investors had already pledged to vote against companies with low female representation at leadership level in upcoming AGMs. It seems the only thing that inspires companies like Smurfit Kappa to take action is pressure and withdrawal from investors. The Women On Board project is raising awareness amongst the public to increase pressure and ask investors to think twice about how they vote with their money. 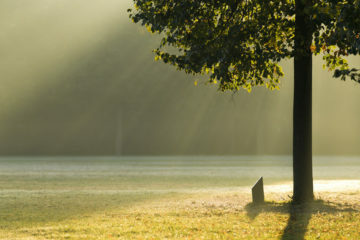 Time and time again, research has shown that companies with diverse leadership report increased innovation, inclusivity and insight – and subsequently higher profitability. A 2012 study run by McKinsey reported that companies with diverse executive boards achieve significantly higher earnings and return on equity, whilst Credit Suisse confirmed the correlation between gender diversity and corporate performance, attributing this to improved leadership, better consumer awareness and an all-around healthier corporate culture. 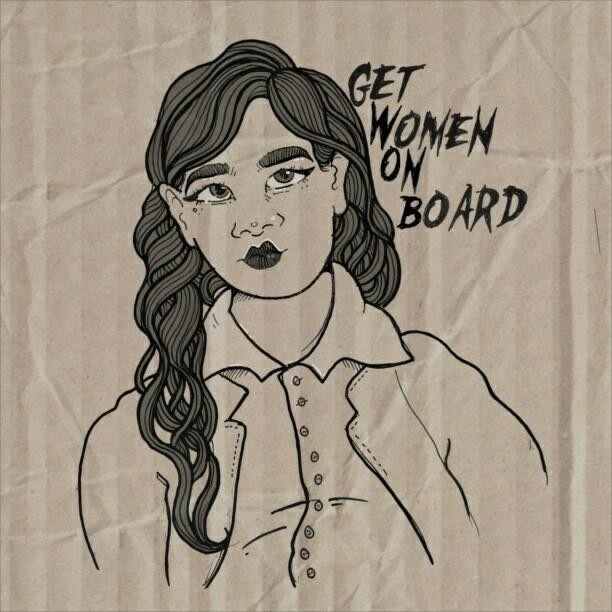 By using Smurfit Kappa’s cardboard against them, Women On Board is highlighting the shocking findings of April’s gender equality report in a fun yet meaningful way. Starting by taking one company as an example and aiming for a ripple effect, we’re quite literally finding thought-provoking ways to ‘put women on (card)board’. 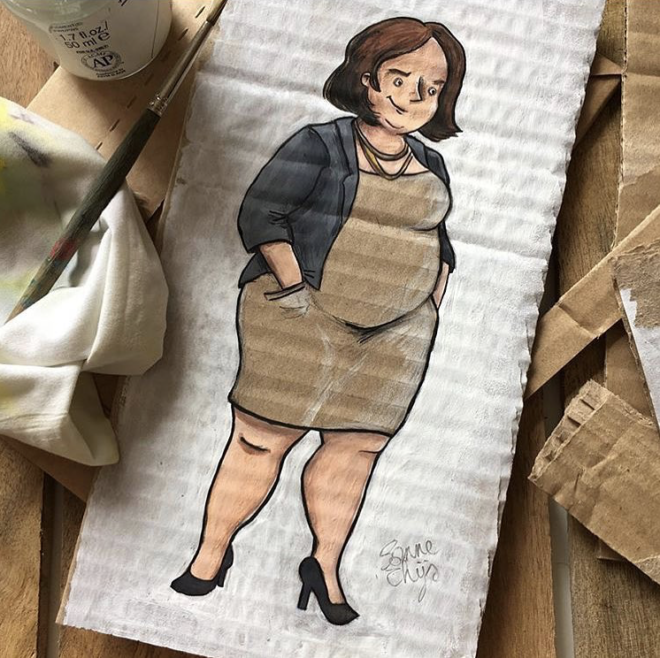 We’re curating an online gallery and Instagram, calling feminist artists and illustrators from all over the world to submit artworks that feature women on cardboard. So far, we’ve received such positive responses and intriguing submissions – it’s exciting to see people engaging so emphatically with the message, and this is only the beginning. We’ve also brought cardboard into the public sphere, placing sneaky guerrilla placards around London as well as interacting with the public by asking them in a tongue-in-cheek manner “How they like their boards”. Usually, with women on them, it turns out. Lack of female representation in the corporate sphere is symptomatic of deeper problems and has a trickle-down effect on many other aspects of life. Quotas are vitally important in highlighting the extent of the issue and ultimately prompting the change we so desperately need. If talent and hard work were judged blindly to gender — along with other systems of discrimination — in the first place, quotas would easily be met. But ultimately, the fight for representation of women on boards isn’t to appease numbers or statistics, it’s to strengthen the economy by championing gender diversity and challenging a status quo that holds everyone back. 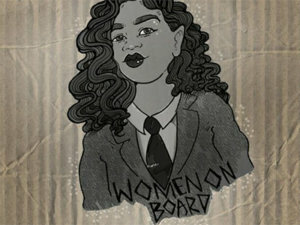 If you’d like to learn more about the Women On Board project and get involved, visit our website www.womenonboard.net or e-mail us at hi@womeonboard.net. We also take submissions via our Instagram page @getwomenonboard with the hashtag #WomenOnBoard. Featured image by Hayley Miller, courtesy of the author.